Garage H in association with Hampton Downs Playday put on a practice day for local drifters and professional drivers wanting to get some track time in and get their car sideways. This allows the chance for newbie drifters or backyard sliders to get out and try their hand at drifting on track. 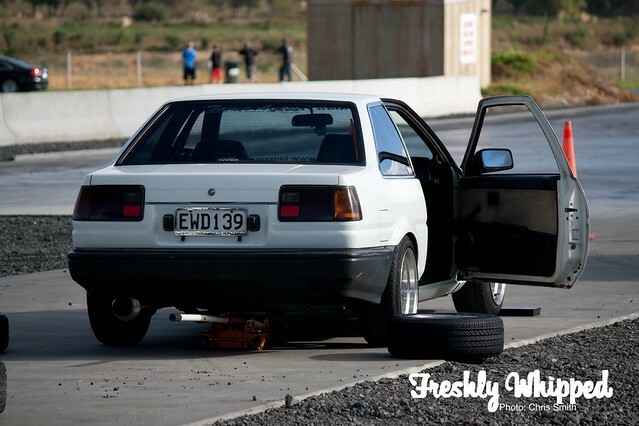 This can be a way for many to get into D1NZ, NZ’s biggest drift league. As cars arrived, everyone was gearing up for the day ahead. Cars like Nico Reid’s S13 arrived and were quick to get out on the track. Nico’s an upcoming D1NZ Rookie Drifter and a member of the South Side Slyders. Others showed up in road cars and prepared them for some sliding. 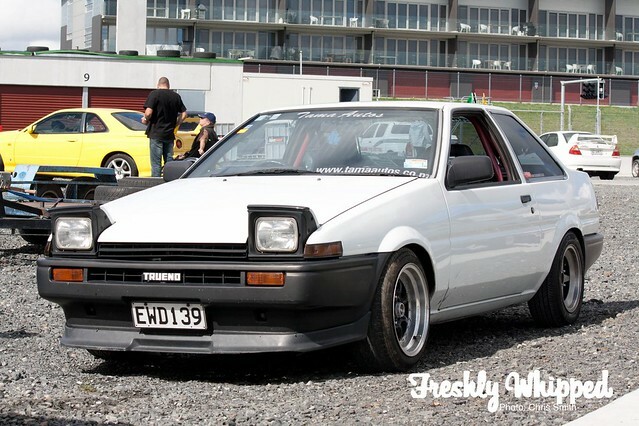 This Trueno was found in an Old Man’s shed and purchased. A very lucky score for the owner. The guys who run this day – Garage H, are known for their ‘Battle Cars’. 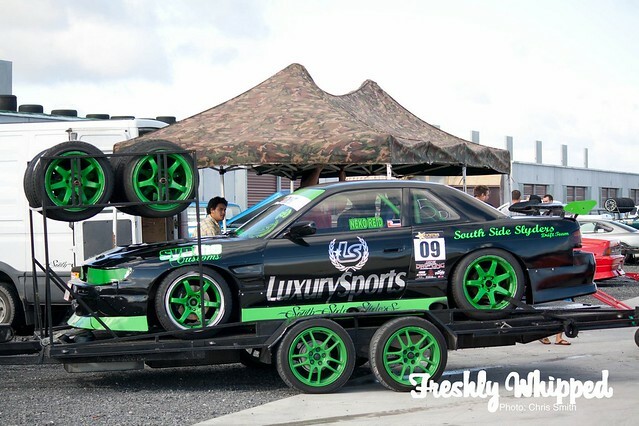 2 S14 Silvia’s that are often known to put on a show at D1NZ events, even though the cars are virtually totalled. 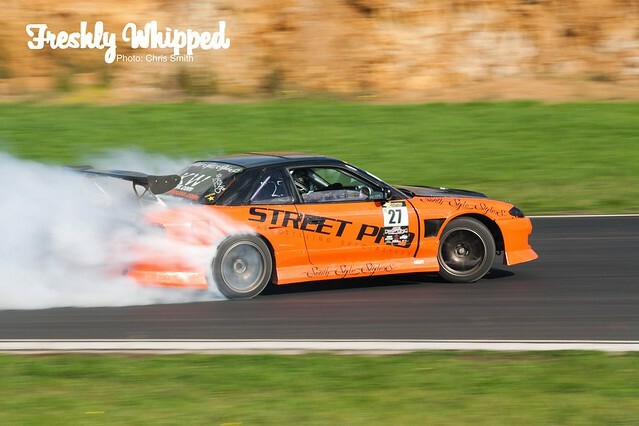 As the cars got out onto the track, this S13 with S15 front bumper definitely knew how to slide. Another member of the South Side Slyders. Sadly not everyone had a good day. This S14 had something go wrong under the hood, with a small fire starting. The driver was quick to put out the blaze. Hopefully we’ll see this car out again soon. Daynom Templeman and his father were out in 2 different RX7′s practicing for next weekends D1NZ final. Daynom in the Gold, his Father in the White. This was one of my favourite shots of the day. Glen had his Laurel out sliding very well. The amount of smoke he was putting out was beautiful. Great to see clouds appearing! Nico had his game face on and had was pulling some amazing moves. It’s great to see a young dude pulling great slides and doing it well. He shows up the big guys easily. One of my favourite cars from the day was this Toyota Mark 2. It’s great to see a big RWD sedan out drifting. The driver was making some massive smoke and some amazing runs. I think he’d make a good D1NZ Rookie. 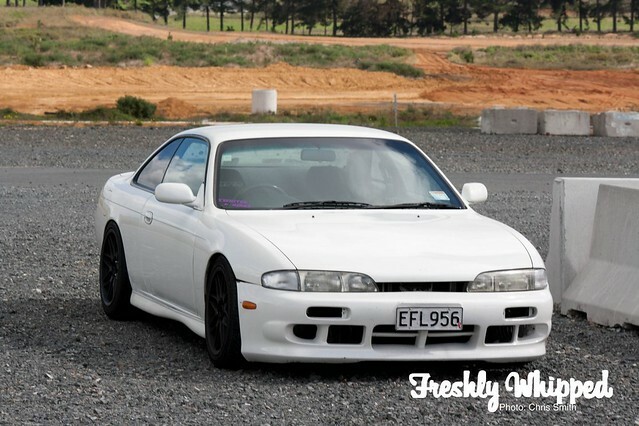 This S14 was looking mighty clean and simple. I’m glad that simplicity is starting to become a more prominent trend. There’s something about Panda Trueno’s that I love. I love it when passengers or drivers wave out to me. It just adds a nice touch to the photo. 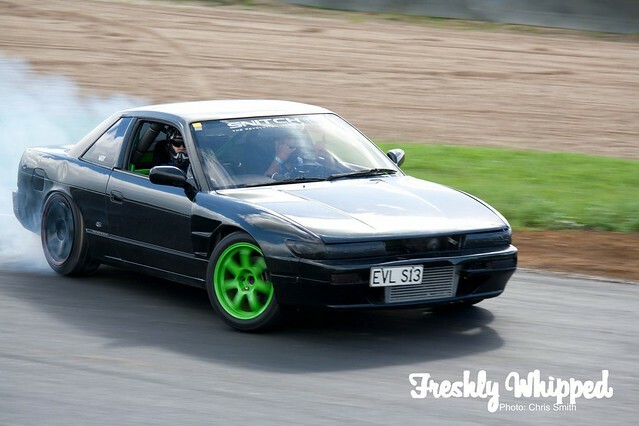 This S13 was pulling some great runs and was a good contender. I’d be happy with just 1 stock RX7, let alone 2 drift ones. Maybe if I was to win lotto. One day..
Here’s another shot of the Mark 2. I love this car. And another shot of Glen’s Laurel. His smoke trails were big and beautiful. For more photos of today, check out my Flickr and on our Facebook page.